With just days to go until the HAJJ, the largest gathering of Muslims in one place each year and more than a year after the first cases of MERS-CoV came to our attention I thought it might be worthwhile concentrating on the Kingdom of Saudi Arabia this month. The above infographic shows the distribution of MERS-CoV by onset province in the Kingdom. I have chosen to use the FluTrackers.com methodology and include one of the first victims who was actually a UK citizen, thus my numbers won’t match those that are officially noted by the Kingdom of Saudi Arabia Ministry of Health. 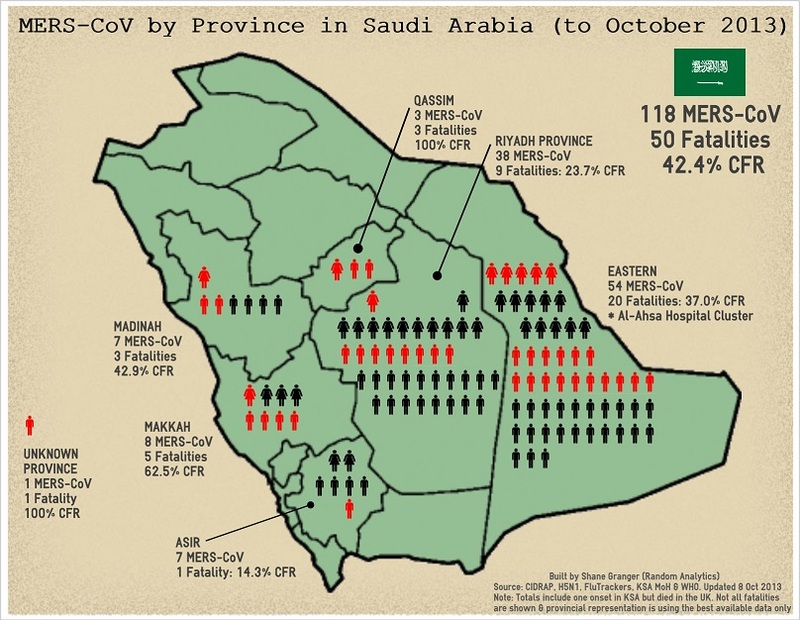 Two points that were made clear to me during my research into the KSA MERS-CoV figures is that the basic data is awful; a far cry from what has been made available from the Chinese during their H7N9 outbreak. I won’t say too much more on that as many including Helen Branswell, Crawford Kilian and Ian M. Mackay have all commented about this for some months now but I would ask if anyone can see an error in the infographic please correct me and I’ll remedy ASAP. A lot of discussion has taken place about the potential for MERS-CoV to utilise the HAJJ as a springboard for a rapid escalation of spread. The second point and key take-away from the infographic has been that the Kingdom is a very large country with a concentration of cases in the Eastern side of the country. At the date of initial publishing (8 October) 92 of the cases were in the Eastern and Riyadh regions, making up 78% of the cases with at least 21 of those cases involving the Al-Ahsa medical facility cluster which should be a singular event. That’s not to say that MERS-CoV will not spread but certainly to date the axis of the disease in removed from the massive concentration of peoples in the Western part of the country. As I did last month with the global MERS-CoV I’ll keep the infographic updated as new information comes to hand. For those that are travelling for HAJJ, safe travels and let’s hope there is not much in the way of news.